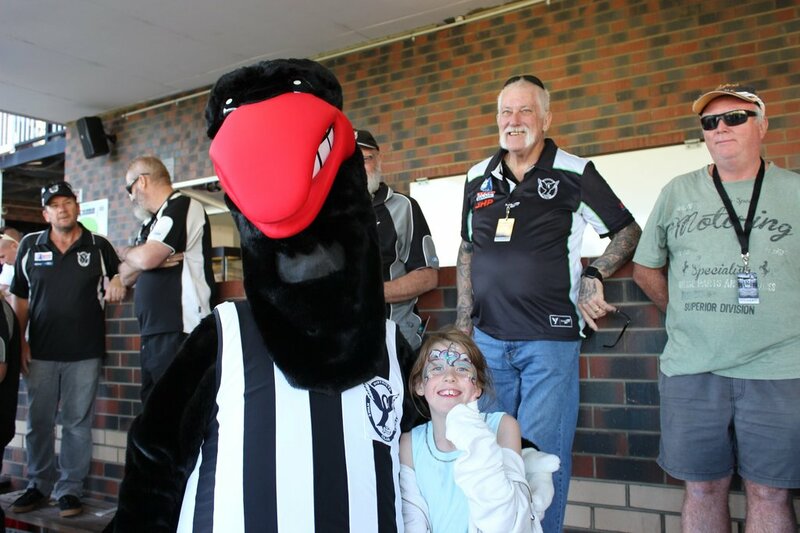 SWAN Districts have fallen to a fourth consecutive loss going down to Perth by 24 points in NAIDOC Round at Steel Blue Oval on Saturday but do remain in fourth position on the WAFL ladder. It was NAIDOC Round in the WAFL celebrated at Steel Blue Oval on Saturday and it turned out to be a memorable day for the Demons who came away with a victory that moves them closer to a finals position while consigning Swans to a fourth straight defeat. Perth was fresh coming off the bye up against a Swan Districts team already on a three-game losing slide. In the previous two meetings between the two teams this season, the Demons started strongly and couldn’t maintain it, overrun by Swans on both occasions. Once again on Saturday Perth started strongly but this time the Demons were able to maintain it throughout the afternoon at Steel Blue Oval to come away with the 14.17 (101) to 11.11 (77) victory. Despite the four losses in-a-row, Swan Districts remains in fourth position with a 5-7 record but is only ahead of Claremont, Peel Thunder and Perth via percentage now. Brayden Noble did fight hard to give Swan Districts a good option in attack kicking three goals from 17 possessions and five marks. Adam Faulkner played likely his best game of a challenging 2018 as well, with two goals from 22 disposals and five marks. Matthew Rogers kicked another two goals from 18 possessions, five marks and five inside-50 entries too against his former team. Jesse Turner racked up 32 possessions to go with eight marks and a goal for Swan Districts while Matt Riggio contributed 26 disposals, Steven Payne 19 and Corey Gault 16 to go with 19 hit outs and a goal. Alex Howard had 16 possessions and seven marks in defence with Jack O'Sullivan performing solidly with 14 disposals and eight marks. Perth started impressively coming off the bye with the first five scores of the contest at a well-populated Steel Blue Oval. That did include goals to Indigenous pair Michael Bennell and Cody Ninyette which was fitting as part of NAIDOC Week. Swan Districts did get an answering major through Brayden Noble but the Demons were on song and Ninyette added two more goals before quarter-time as Perth had 10 scoring shots to two in the term to lead by 23 points at the first break. Swan Districts did manage the first goal of the second quarter thanks to former Demon Matthew Rogers. But Perth hit back through returning key forward Spencer White. But when Swans managed the last two majors of the half with Perth not taking its chances in front of goal, with Steven Payne and Corey Gault kicking truly, the home team was right back in the contest trailing by just 13 points at half-time. Swan Districts were then just seven points behind to start the second half when Noble kicked a third goal before Bennell and Warrick Wilson traded goals for their respective teams in NAIDOC Week. The Demons continued to have the answers, though, and kicked five of the last six goals of the third term, including a fourth to Ninyette, with Perth heading into the three quarter-time huddle with a commanding five-goal advantage. Ninyette kicked the first goal of the last term to give him five for the afternoon and while Swan Districts kicked three of the last four goals of the contest, the Demons still cruised to the 24-point victory at Bassendean. The improved signs from Swan Districts' reserves continued on Saturday at Steel Blue Oval with a 58-point win against Perth. Swans' reserves kicked four goals to one in the first quarter before another four goals to one in the second term to see them open a 32-point advantage by the main break. Swan Districts then piled on six goals to two in the last quarter to secure the 17.7 (109) to 7.9 (51) victory. Tom O'Brien put his hand up for a league debut with Swan Districts having kicked five goals from 11 kicks while also having 14 hit outs while in the ruck. Mitchell Bain, Callum Garcia and Joel Garcia all kicked two goals each for the black-and-whites. Brandon Erceg compiled 22 possessions for Swan Districts, Joel Curtis 22, Albert Dean 20, Josh Cipro 19, Garcia 19, Chad Daniels 18, Jacob Coniglio 17 and Patrick Italiano 17. Swan Districts and Perth's colts teams did battle on Sunday morning at Steel Blue Oval with Swans coming away with a 39-point victory. Swan Districts kicked two goals to one in the first quarter and then after a goal apiece in the second term, Swans led by nine points at half-time. Swans had eight scoring shots to three in the third quarter but could only manage two goals from those to lead by just 14 points at three quarter-time. But the black-and-whites got rolling in the last quarter with the only four goals to run out 9.15 (69) to 4.6 (30) winners. The win keeps Swan Districts in third position on the colts ladder at 8-4 while Perth is 5-7 in sixth. Nelson White kicked two goals for Swan Districts to go with 17 possessions and four marks with Matthew Russo booting two goals as well to go with 14 disposals. Kade Wallrodt racked up 27 possessions for Swans, Jackson Beck 26, Atem Deng 24, Malaki Rodoreda 22, Ethan Nordahl 22, Patrick Farrant 18 and Matthew Germs had 39 hit outs in the ruck. 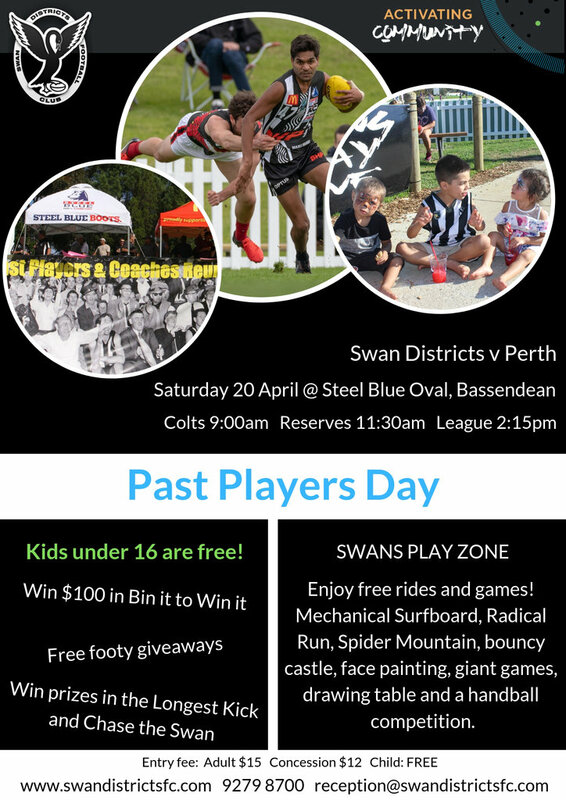 Swan Districts will now look to try and end its four-game losing streak this Saturday back at Steel Blue Oval against an East Perth team who has lost six straight matches as well. SWAN DISTRICTS – Goals: Noble 3; Faulkner, Rogers 2; Gault, Turner, Payne, Wilson. Best: Turner, Faulkner, Noble, Rogers, Riggio, Payne, Gault. PERTH – Goals: Ninyette 5; Byrne, Cary, Bennell 2; Yeo, White, Dennis. Best: Ninyette, Sinclair, Leggett, Colledge, Jones, Yeo, Eyres, Taylor.